‘Too much suffering!’ I say, quickly, determinedly, almost angrily, in response to the therapist’s question. She wants to know what my biggest problem is right now. She wants to figure out how to focus down on what we try to deal with this session. Which strand of wool shall we pull from the tangled mess in front of us that is me, today, here, now? My answer hasn’t really helped her. She smiles sympathetically and lowers her eyes. Mine are radiating challenge, fury, and acres of self-pity. Right now, I want to lay into anyone I can justifiably blame for my suffering. Anyone, that is, apart from the people that caused it – that still doesn’t feel safe. But I’m hot with agitation, I’m aching with abandonment, and I have that edgy, dangerous sense of wanting to destroy something. Preferably myself. The therapist pauses, waits, calms. She’s sucking the energy out of my fight. She’s not looking directly at me, but slightly off to one side, and her upper body is languidly angled away from me too. There’s a soft gaze on her face, her wrinkles crumpled together full of pink lifefulness. She’s present and real and human and here, and it’s all I can do not to be defused by her. I want to fight her, I really do. She’s just not rising to it. ‘I see your suffering,’ she says, the words melodic and gentle. Now she’s looking at me, and she’s evidently not scared of me. She’s wiping down the space between us with tenderness. ‘Tell me about your suffering.’ Something about her softness breaks my aggression and I look down, and sigh. There’s pain in that sigh. It burns to breathe in again. I wish I had some tears, but I’m beyond that. It hurts too much for emotion. This suffering has perched within awareness ever since my breakdown, two years previously. Prior to that, I had dissociated from it. Then it erupted, sticky and hot and a poisonous, sulphurous stench, from behind my amnestic walls. It had always been there, but I had been switched off from it. But this torturing slew of post-traumatic affects – flashbacks, switching, high-pitched distress, the low, mad-making whine of constant despair – has blanketed every waking (and most non-waking) moment for so long now that I cannot remember any more what it is like not to wake up nauseous with dread, terrorised by my own feelings. It is all I can do, every single day, to merely get through each day, and to do so without killing myself. I can’t describe how she responds. She’s not silent, but she doesn’t use words either. I don’t know if she even makes a sound. There’s just something that comes back to me, like a modulated echo. I feel my pain radiate out from me, and I feel her absorb it, and then back it comes towards me, but diluted. Smaller. More pastel. And for just a moment, the pain eases, and moves back a few inches. It’s still there but it’s muffled. It’s more bearable, less intense, and its edges blur. I don’t know how she does it, especially without words. It’s something about presence. It’s some silent communication between her nervous system and mine. It feels primitive. It is wordless. It’s a relief for the pain to recede, if only a little. I don’t want this moment ever to end. But of course it will. Even still, it gives me hope. I realise, in this moment, that this suffering is fluid. It’s not solid, and unchanging. It can move. Previously, the therapist may have said, ‘Just notice’ but she doesn’t need to, because I have, and she knows it. So we sit a little while longer. ‘What am I feeling?’ she asks, when the silence has run its course. I look up, surprised. I didn’t think therapy was about her. I’m baffled. Why are we suddenly talking about what she’s feeling? What’s going on? I settle back down out of my alarm-at-novelty reaction and consider this. What is she feeling? And I realise, with greater alarm, that I have no idea. Do therapists feel anything at all during sessions? Do they even feel anything outside of sessions? It’s as if I’m used to seeing through her, and I’ve never stopped to consider the here-ness, the now-ness, the real-ness of her emotions. In a way, I didn’t think they mattered. I feel embarrassed at my self-absorption. ‘I have no idea what you’re feeling,’ I say, quietly enough that I hope she won’t hear me. She half-smiles an acknowledgement, but continues to pierce into me. She’s right there, right in my face, challenging me, pushing me, whilst also hanging back, supportive, empathic, giving me space. ‘Have a think,’ she says. I stare at her blankly. How do I even go about figuring out what she’s feeling? I am totally at a loss. I shrug my shoulders hopelessly, feeling way out of my comfort zone. ‘Neutral?’ I guess. But I just don’t know how to know. I am, at this moment – as at so many moments – emotionally blind. I look at her, astonished. I still don’t understand. She speaks slowly, allowing each word to drip into my startled brain. She takes a long look at me. I’m stymied in confusion. ‘How does that make you feel?’ she asks. I shake my head and clutch myself smaller. Her head bobs down and she makes a noise that is full of pain. I haven’t understood her words, but again I understand that sound. It goes right into me. Something seems to split apart inside me, in my chest. It is both painful and pleasurable. I don’t understand it. Suddenly there are words, albeit I don’t know where they’ve come from. ‘I feel ashamed,’ I reply, ‘because I don’t deserve for you to have compassion. I feel ashamed because I don’t want my pain to cause you pain. I feel ashamed because … because it’s like a feeling on the inside of me that wants to run a million miles away from you now. You’re being kind, and yet somehow it feels dangerous. Somehow it feels scary. Somehow it feels unbearable, and I want you to leave me alone …’ I trail off, appalled at my confession. She nods, as if she’s not surprised. It’s unnerving to work with someone who is less surprised at what I say than I am myself. This isn’t real, so I find it more comfortable to engage with. I like hypothetical. It gives me the space I need to downregulate from the intensity of intimacy. ‘I’d feel hurt,’ I say, and my confidence rushes back in. I laugh at the preposterous possibility that this kind, gentle, attuned human being could be so suddenly self-centered. She smiles back at me, but there’s fire in her eyes still. ‘How else could I respond to your pain and suffering, but with compassion?’ she asks, and it’s so simple now that I see it. But this is a new idea to me. My life has been full of so much pain, such endless, tormenting suffering, both the abuse itself and then the fall-out from it, and only now, in therapy, am I consistently experiencing compassion in response to it. It seems like such a rare commodity in life, in society, even among friends. ‘How often do you respond to your own suffering with compassion?’ she asks. Again, she’s not making sense. I didn’t know this was a thing. I’ve heard of self-compassion – mainly from this same therapist, who seems to have shares in it – but I’ve never been able to apply its relevance to me. It’s just jargon. I don’t see it as real. ‘Yes.’ As ever, I don’t know how she reads me so effortlessly. It’s like we sit in this room together and there is a one-way mirror between us: she seems to see into me, feel what I’m feeling, sensing what I’m thinking. And in return she is a blank wall. It’s helpful that she’s spelling it out for me like this. I know that she wears her emotions on her face. It’s just that I am illiterate to them. The idea sounds appealing, but I still don’t know what she means. She’s not going to let this go. I might as well go with it. ‘Because you’re here,’ I say, vaguely. ‘Because you’re listening. Because you care.’ I feel embarrassed almost to the point of unconsciousness to say this last one. ‘So compassion is a bridge towards connection?’ she says. I shrug and nod and feel confused. Her suggestion sits like a fused firework between us. I feel a surge of abhorrence, and terror, and shame. ‘I can’t!’ I say, suddenly agitated. I don’t wait for her to prompt me with a why. I plunge right into it, to allow the words to come before I’ve censored them away. ‘And …?’ Because there’s something more that I haven’t articulated yet. This is the fear resident in the depths of me: that I couldn’t cope with my pain when the trauma was happening, and that I can’t cope with it now. My only strategy for surviving it was to dissociate: to block it out of consciousness, to burrow it away in a segregated self-system, away from the realm of daily life, where it can’t disable me. This pain, this suffering, this trauma – it sits like a radioactive core within myself, leaking out its carcinogenic fallout into my life, killing me slowly. It feels inevitable. But to open the casket and bring it up to the surface feels like psychological suicide. She’s nodding, eyelids pursed together, draining out of every word I speak its full meaning, its emotion, its truth. ‘I can’t be compassionate towards myself,’ I say, pushing the stake into the ground and daring her to cross it. We sit again for a while and I at least feel heard. Eventually, I look up at her, because I’m waiting for her challenge, but it hasn’t come. It’s as if she doesn’t want to force it onto me, so she’s waiting to be asked. I know my belief is born of terror. I don’t want it to be true. So I ask. Only with my eyes, but I ask. A spark lights on the inside of me. I raise both eyebrows, indicating both questions. I settle in for today’s psychoeducation masterclass. This has a double benefit: not just the insight and awareness that I need to move forwards, but the emotional downregulation from the intensity of emotion between us, which was beginning to push me overboard. She knew it, and that’s why we’ve reverted to the safety of facts. There’s only so much compassion I can receive in one go and the box is full for today. But my front brain is zinging with anticipation and I can feel my guts relax. We talk about the barriers for compassion. Fundamentally, I am afraid that it will overwhelm me. That if I go there, I’ll never be able to come back. In my mind’s eye, I see the suffering from my childhood trauma as an incandescent rage, an uncontrolled fire burning in an office block. If I go near it, I will die. If I open a door, it will belch out at me, and reduce me to ash. That’s my mental picture. And I realise, first and foremost, that the image I have of it in my mind is adding to the problem. I see it as huge, and myself as incapable. That’s the first thing I could change: I could repaint the picture. She tilts her head and furrows a questioning look towards me. I don’t really know what I mean by this. It’s more a stirring on the inside of me than a fully-formed thought. I’m alert with the newness of this. I urge her on with my eyes. ‘Your parts maybe feel like you’re saying ‘there, there’ to shut them up from their pain, rather than being willing to feel it with them,’ she says, with aching gentleness. ‘These traumatised parts of you need you to be as compassionate towards them as I am towards you,’ she says. Could I ever be as compassionate towards anyone as she is towards me? I hurt with the yearning and yet the impossibility of it. I’m struck by what she’s saying like it’s a thunderclap of new insight into how other people manage their feelings. It has never occurred to me before, that a simple technique, or skill like this, could help to manage emotion. And it has never occurred to me either that she is feeling my pain while I’m talking, and that sometimes it overwhelms her. Or that she has a strategy for managing it. I thought she was just born this way. She’s too clever, I think, and of course then rebound into, I’m so useless, by comparison. But I don’t want to lose this insight, so I press my brain into applying it. She nods. This much is obvious. I look at her, surprised again by this new idea. Aaaah. This is it. This is my life. This is me. Yes. This is about-turn for me, but yes. This helps. This reduces the shame of why I’ve not managed it before. I haven’t had the right circuitry, because I’ve never had the experience of compassion until now. My experience of compassion in the room, here, in therapy, with this therapist, is providing the building blocks for me to develop self-compassion towards myself. Slowly but slowly. ‘But what if the suffering is ongoing?’ I say. I need to pinpoint all possibilities. But from inside comes the dread feeling again, like a turning away. All my life, unconsciously, I have been seeking compassion. In all the myriad ways I have sought help, or support, or sympathy, or empathy, what I’ve been looking for is for someone to hear my pain, and validate it, and sit with me in it. At times I’ve wanted to shout it from the rooftops. I’ve wanted the whole world to know how much pain I’m in. And mostly I’ve heard only silence in return. Because the world is not good at compassion. I’m not good at compassion. And I’m needing this experience, now and here and week by week, in therapy, of receiving compassion from an attuned, empathic, grounded human being, so that I can know what it is, so that I can grow the neurobiological substrates to be able to express it towards myself. This is the start. I have the capacity for compassion, because I am a human being, and to be human is to be compassionate. We are built to bear suffering – both our own, and other people’s. I couldn’t manage my suffering when I was a child, because it was too much, and because I was only a child. My brain hadn’t developed fully. I didn’t have the space inside me to bear that kind of pain. But I’m an adult now. My parts often present as child-like, but the way through this suffering is not to continue in my childhoodedness. It’s to grow upwards and forwards into the fullness of the adulthood of me, where I am resilient enough and capacious enough to sit with myself in my suffering, and be compassionate. This is my challenge. This is my goal. I feel unexpectedly resolute, even hopeful. But I’m aware – acutely, almost painfully – that one discussion about compassion has not suddenly given me the skills to do it. And yet, as with so many things that happen in this room, the first step is insight, the second step is intention, and the third step is implementation. Steps, steps, steps. As long as I keep taking steps, I’ll move towards my destination. I had therapy mainly between 2006 and 2015. These blog posts are not verbatim accounts of sessions, but rather the client equivalent of ‘case studies’ - amalgamations of various sessions, ‘narratively true’ rather than ‘historically true’. Although often written for stylistic purposes in the present tense, they are very much from a past period of my life. Ideally they should be read within the wider context of other blog posts, articles and my book, to give a more integrated and rounded sense of where I was at, where I’m at now, and the process that took place between those two points. I have been on a journey of recovery, and the difference in me from when I was in therapy (especially at the beginning) to now is testament to the brain’s ability to recover from even the most appalling suffering. My primary work now is writing, followed closely by training therapists, counsellors and other professionals to support survivors of trauma. Regrettably I cannot provide one-to-one support but our charity framework PODS (Positive Outcomes for Dissociative Survivors) provides a helpline and a range of other services: please go to www.pods-online.org.uk for more information, and https://support.pods-online.org.uk/start-here if you are looking for support. Yes I want to be notified when a new blog is published! Thanks! You'll get an email when we post new content. Keep me up to date with products and services. False compassion. And where it stems from, and where I still receive it from in the present, and what/who it will mirror. It’s toxic and cements more dissociation. It cements more uncompassion within myself. Thank you for a wonderful blog. The most insightful to me I’ve read. It has helped me trust what I intuitively have realised for a while now. Thank you, well explained in understanding self compassion and how to implement self compassion. Plus learning to cope with overwhelming empathy in this world of pain and not suffocate with it all. Your words are helping to save us, post by post. It is beyond reassuring to hear you recount, most exactly, how I feel in therapy… and provide me with hope that “the therapist’s” perspective is not one of disgust, impatience and fury … which were the only things I could imagine. Thank you again and again. I was thinking exactly the same. I worry will my therapist think that Carolyn is ‘acceptable’ within the trauma community? (sorry Carolyn but I am sure you can empathise). I definitely can’t ‘bring’ anything I’ve read to a session in case ‘it’s judged as unacceptable’ and by association I’m unacceptable. And this is with someone who I’ve formed some degree of attachment with. But, your writing does help me to structure my thoughts before a session – but then maybe I am just a plagiarist. Ugh! What does one do when one has learned how to give self-compassion, but has now become so utterly emotionally and physically exhausted that I just don’t have the energy/strength to cope with any more of my own pain. I feel like an adult attempting to parent a bunch of traumatised children, when i am so physically ill I just have nothing left to give. I am able to feel compassion towards others, but I find it difficult to feel it towards myself especially the younger parts. I know in my head it’s what I need and I’m getting there. Thank you yet again for enabling me to normalise the anger towards myself for feeling anything at all. I do hope one day I will be able to shed all the unshed tears that still hold me back instead of blanking off or shutting down as soon as I feel my throat tighten. Compassion, for me as a therapist, is loving when the client is feeling wholly unlovable, unloving and unloved. It is a tenderness that permeates the space between us….it is the acknowledgment of pain and suffering where perhaps, before, there has been none. It envelops like a warm blanket and its very fibres of softness and comfort evidence that the client is worthy of this gentle touch. A touch that can be turned around, redirected and little by little, practised on the self even in just small, measured ways at first. And in that, for me, lies the very essence of the beginnings of recovery. I can’t say too much because this is the first time I’ve responded and I feel scared and maybe it’s a stupid thing to do. But I want to say thanks Carolyn. I’ve had two years counselling and learned heaps from that counsellor about compassion and self-compassion. Now I’ve just had my second session with a new counsellor because I was unable to return to the first one. It’s very hard but reading this blog has helped me to hope that it will be okay and I am maybe capable of getting somewhere. Thank you I read your book during my last counselling and it and your blogs give me hope. Thank you for writing about compassion. It makes more sense now, and I can see the benefits for helping self and others. As you say we all suffer pain, some more than most. It can be difficult to talk about. It’s not a definition or some bullet-points on a page, a menu of things that were done or could have been done, or might yet be done. It’s something to do with me as a person, the me that I’m so scared to show you, that I’m so scared to be, because of what happened. 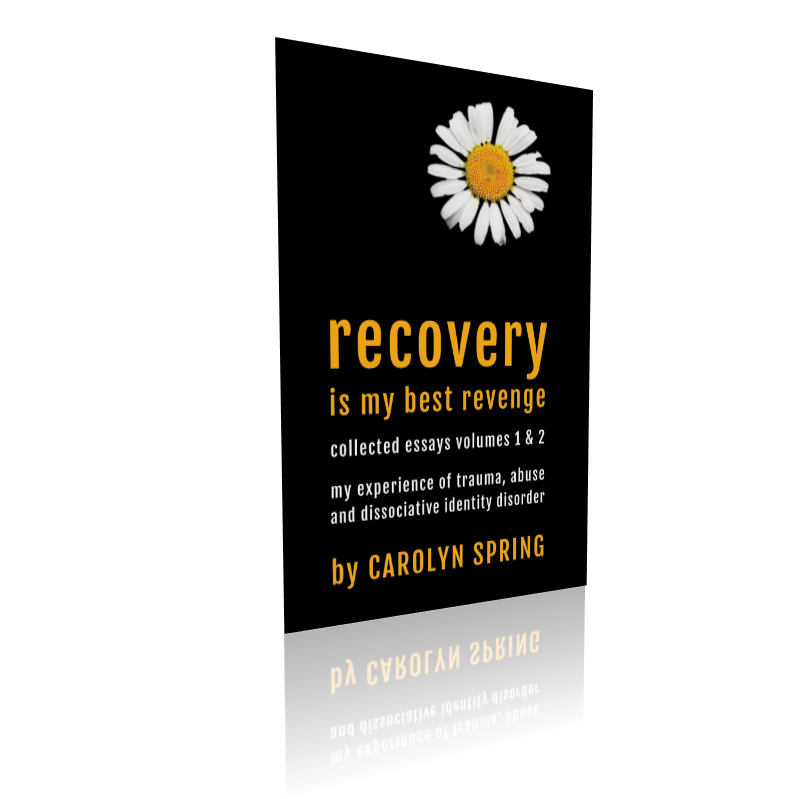 Why not take a look at her book, 'Recovery is my best revenge'?